Description: Everyone has a little favorite animal, a dog, a cat or a fluffy rabbit. But if you want to be original, you can have a pet that most people hate or are afraid of. 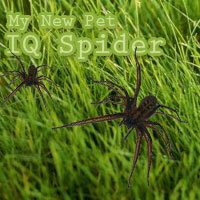 With the new IQ mobile application you can now have a spider pet in you mobile phone. Show your pet to your friends and see if they will still find you ordinary. And if they will be scared enough seeing your guard pet, maybe they will think twice when they want to browse your mobile phone files.